This article is about the casino in Monaco. For the casino in Las Vegas formerly known as the Monte Carlo Resort and Casino, see Park MGM. 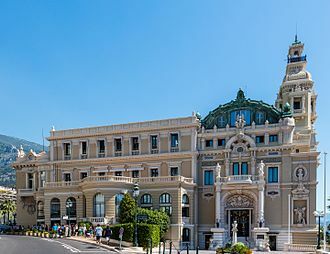 The Casino de Monte-Carlo is owned and operated by the Société des bains de mer de Monaco, a public company in which the Monaco government and the ruling royal family have a majority interest. The company also owns the principal hotels, sports clubs, foodservice establishments, and nightclubs throughout Monaco. In 1854, Charles, Florestan's son and future Prince of Monaco, recruited a team of Frenchmen—writer Albert Aubert and businessman Napoleon Langlois—to devise a development plan and write a prospectus to attract 4 million francs needed to build a spa for the treatment of various diseases, a gambling casino modeled from the Bad Homburg casino, and English-styled villas. Granted the concession of 30 years to operate a bathing establishment and gaming tables, Aubert and Langlois opened the first casino at 14 December 1856 in Villa Bellevu. Intended to be only a temporary location, the building was a modest mansion in La Condamine. In the late 1850s, Monaco was an unlikely place for a resort to succeed. The lack of roads needed to connect Monaco to Nice and the rest of Europe, and the absence of comfortable accommodations for visitors, as well as the concessionaires' failure to publicize the new resort, resulted in far fewer customers than was originally anticipated. Unable to raise the capital needed to operate the money-losing enterprise, Aubert and Langlois ceded their rights to Frossard de Lilbonne, who in turn passed it to Pierre Auguste Daval in 1857. During this initial period, the casino had been moved several times, until it finally ended up in the area called Les Spelugues (English: The Caves). Construction at this site began on 13 May 1858 to designs of the Parisian architect Gobineau de la Bretonnerie and was completed in 1863. Gobineau de la Bretonnerie also designed the neighboring Hôtel de Paris (constructed in 1862). Although the casino began to make a profit in 1859, Daval was not up to the task. Just like his predecessors, he was incompetent and lacked the ability to bring the gambling enterprise to the scale envisioned by Princess Caroline. Frustrated, she dispatched her private secretary M. Eyneaud to Germany, hoping to recruit François Blanc, a French entrepreneur and operator of the Bad Homburg casino. Blanc declined the offer. It took a lot of time and persuasion on the part of Princess Caroline to convince the Blancs to move to Monaco. Princess Caroline even appealed to Madame Blanc, whom she befriended during her first visit to Bad Homburg, with a suggestion that Monaco's mild climate would be good for Madame Blanc's ill health. Finally, in 1863 François Blanc agreed to take over Monaco's casino business. To manage the new venture, a company—the Societe des Bains de Mer et du Cercle des Etrangers—was formed with capital of 15 million francs. Among the prominent investors were Charles-Bonaventure-François Theuret, Bishop of Monaco, and Cardinal Pecci, the future Pope Leo XIII. Blanc became the single majority stockholder in the company and received a 50-year concession, which would last until 1913. Blanc used his connections to quickly raise the required capital, and began the massive construction. On Blanc's insistence, the Spelugues area where the gambling complex was located was renamed to make it sound more attractive to casino visitors. A few suggestions were considered, and the name Monte Carlo was chosen in Prince Charles' honor. In 1878–79, the casino building was transformed and expanded to designs of Jules Dutrou (1819–1885) and Charles Garnier, the architect who had designed the Paris opera house now known as the Palais Garnier. François Blanc knew Garnier, because Blanc had provided a loan of at least 4.9 million gold francs to the cash-strapped government of the French Third Republic, so that the opera house, which had been started in 1861, could be completed. 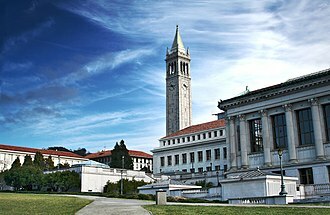 It had finally opened in 1875. The alterations to the Casino de Monte Carlo included the addition of a concert hall (designed by Garnier and later named the Salle Garnier), located on the side of the casino facing the sea, and the redesign and expansion of the gaming rooms and public spaces, mostly carried out by Dutrou on the side of the casino facing the Place du Casino, where the Hôtel de Paris Monte-Carlo and the Café de Paris were also located. In 1880–81, the casino was expanded again, to the east of Dutrou's Moorish Room, by the addition of the Trente-et-Quarante Gaming Room, also designed by Garnier. Subsequent additions and expansions, and the remodeling of the Trente-et-Quarante Gaming Room into the Salle des Américains, have mostly obliterated Garnier's contributions to this part of the casino, except for some ceiling decorations. In 1898–99 the Salle Garnier was remodeled by architect Henri Schmit, primarily in the stage area, so that it would be more suitable for opera and ballet performances. However, much of Garnier's original facade and the interior design of the auditorium itself remain intact. Despite all of the later additions and modifications, the casino still has a distinctly Beaux Arts style. In 1921, the first Women’s Olympiad was held at the casino gardens. 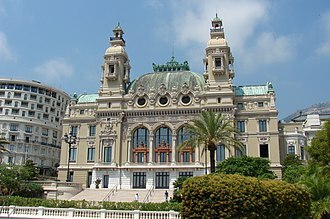 Until recently, the Casino de Monte-Carlo has been the primary source of income for the House of Grimaldi and the Monaco economy. In 1873, Joseph Jagger gained the casino great publicity by "breaking the bank at Monte Carlo" by discovering and capitalizing on a bias in one of the casino's roulette wheels. Technically, the bank in this sense was the money kept on the table by the croupier. According to an article in The Times in the late 19th century, it was thus possible to "break the bank" several times. 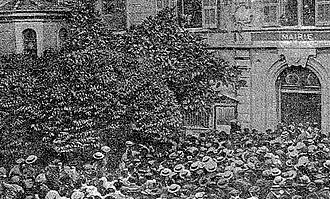 The 1892 song "The Man Who Broke the Bank at Monte Carlo", made famous by Charles Coborn, was probably inspired by the exploits of Charles Wells, who "broke the bank" on many occasions on the first two of his three trips. According to the book Busting Vegas by Ben Mezrich, a team of blackjack players recruited from the Massachusetts Institute of Technology by team-leader Victor Cassius and Semyon Dukach attempted to break the bank at Monte Carlo with the assistance of a team-play-based system. The book describes how the management of Monte Carlo responded to the success of the team. According to Semyon the account in Busting Vegas is accurate aside from the fact that the team was made up of himself, Andy Bloch and another player he refers to as "Katie". The architecture of glamorous Belle Époque building of the Casino de Monte-Carlo was used by Ian Fleming to describe a casino in "Royale-Les-Eaux", a fictional resort featured in Fleming's first Bond novel, Casino Royale (1953). Monaco and its casino were the locations for a number of James Bond movies, including Never Say Never Again and GoldenEye, as well as for the "Casino Royale" episode of the CBS's Climax! television show. The casino served as a filming location for the 2004 film Ocean's Twelve. ^ "Le Casino de Monte-Carlo joue la carte de l'ouverture". nicematin.com. Archived from the original on 2012-08-05. ^ Edwards, Anne (1992). The Grimaldis of Monaco: The Centuries of Scandal - The Years of Grace. William Morrow. ISBN 978-0-688-08837-8. .
^ "Chronology of Gambling (1852-1900)". gamblinghistory.info. ^ Folli & Merello 2004, pp. 112, 114. ^ Sharma, K.K. (1999). Tourism and Culture. New Delhi: Sarup & Sons. ISBN 81-7625-056-2. ^ a b Folli & Merello 2004, pp. 116–117, 136; Bouvier 2004, pp. 190–192. ^ Folli & Merello 2004, pp. 132–133. ^ "ThePOGG Interviews - Semyon Dukach - MIT Card Counting Team Captain". Retrieved 10 November 2012. Folli, Andrea; Merello, Gisella (2004). "The Splendour of the Garnier Rooms at the Monte Carlo Casino" in Bonillo et al. 2004, pp. 112–137. Denby, Elaine (2004). Grand Hotels: Reality and Illusion. London: Reaktion Books. ISBN 9781861891211. 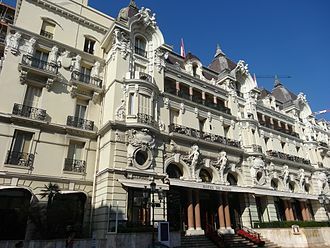 Wikimedia Commons has media related to Casino de Monte Carlo. A slot machine, informally fruit machine, the slots, poker machine or simply slot, is a casino gambling machine with three or more reels which spin when a button is pushed. Many modern machines are equipped with a legacy lever in addition to the button. Slot machines include a currency detector that validates the money inserted to play, the machine pays off according to patterns of symbols visible on the front of the machine when it stops. Modern computer technology has resulted in variations on the slot machine concept, Slot machines are the most popular gambling method in casinos and constitute about 70 percent of the average US casinos income. The slot machine term derives from the slots on the machine for inserting and retrieving coins, fruit machine comes from the traditional fruit images on the spinning reels, such as lemons and cherries. Sittman and Pitt of Brooklyn, New York, U. S. developed a machine in 1891 which was a precursor to the modern slot machine. It contained five drums holding a total of 50 card faces and was based on poker and this machine proved extremely popular and soon many bars in the city had one or more of the machines. Players would insert a nickel and pull a lever, which would spin the drums and the cards they held, the player hoping for a good poker hand. To make the better for the house, two cards were typically removed from the deck, the ten of spades and the jack of hearts. The drums could be rearranged to further reduce a players chance of winning, the bell gave the machine its name. Three bells in a row produced the biggest payoff, ten nickels, Liberty Bell was a huge success and spawned a thriving mechanical gaming device industry. Even when the use of these devices was banned in his home state after a few years. The Liberty Bell machine was so popular that it was copied by many slot machine manufacturers, thus in 1907, manufacturer Herbert Mills from Chicago produced a slot machine called the Operator Bell. By 1908 lots of bell machines were installed in most cigar stores, bowling alleys, early machines, including an 1899 Liberty Bell, are now part of the Nevada State Museums Fey Collection. Other early machines, such as the trade stimulator, gave out winnings in the form of fruit-flavoured chewing gums with pictures of the flavours as symbols on the reels, the popular cherry and melon symbols derive from this machine. Craps is a dice game in which the players make wagers on the outcome of the roll, or a series of rolls, of a pair of dice. Players may wager money against each other or a bank, because it requires little equipment, street craps can be played in informal settings. Craps developed from a simplification of the early English game of hazard and its origins are complex and may date to the Crusades, being influenced by French gamblers. There was a flaw in Bernards version of the game in which players could exploit the casino using fixed dice and taking advantage of the way players can bet with or against the dice thrower. An American dice maker named John H. Winn introduced the dont pass betting option in order to fix this problem, the game, first known as crapaud, reportedly owes its modern popularity to street craps. Street craps may be played by rolling the dice against a backstop, such as a curb or stair-stoop, or without a backstop, during World War II, street-style craps became popular among soldiers, who often played it using an Army blanket as a shooting surface. With no backboard or sidewalk curb to hit against, this rise to presumed methods of dice control. Bank craps or casino craps is a game played by multiple or a single player betting on the outcome of the dice, the players and casino employees stand or sit around a large oval craps table. In most houses sitting at a table is discouraged unless the player is handicapped. With the table oriented with its long sides running left to right, along one side is the casinos bank – thousands of chips, stacked 20 high. Along the opposite side of the tub is usually a long, the left and right U-shaped sections of the table each have the same bet areas marked on the layout, with space for usually up to eight players to stand and place their bets on each side. An additional group of bets, referred to as proposition bets, is in the middle of the layout, the top rim of the table has horizontal grooves for players to keep their chips while not in play. Each employee watches for mistakes by the others because of the large number of bets. Roulette is a casino game named after the French word meaning little wheel. The ball eventually loses momentum and falls onto the wheel and into one of 37 or 38 colored and numbered pockets on the wheel The first form of roulette was devised in 18th century France. A century earlier, Blaise Pascal introduced a form of roulette in the 17th century in his search for a perpetual motion machine. The game has played in its present form since as early as 1796 in Paris. The description included the house pockets, There are exactly two slots reserved for the bank, whence it derives its sole mathematical advantage and it goes on to describe the layout with. two betting spaces containing the banks two numbers and double zero. The book was published in 1801, an even earlier reference to a game of this name was published in regulations for New France in 1758, which banned the games of dice, hoca and roulette. The roulette wheels used in the casinos of Paris in the late 1790s had red for the single zero, to avoid confusion, the color green was selected for the zeros in roulette wheels starting in the 1800s. In some forms of early American roulette wheels - as shown in the 1886 Hoyle gambling books, there were numbers 1 through 28, plus a single zero, a zero. The Eagle slot, which was a symbol of American liberty, was a slot that brought the casino extra edge. Soon, the tradition vanished and since the features only numbered slots. Existing wheels with Eagle symbols are rare, with fewer than a half-dozen copies known to exist. Authentic Eagled wheels in excellent condition can fetch tens of thousands of dollars at auction, in the 19th century, roulette spread all over Europe and the US, becoming one of the most famous and most popular casino games. A legend says that François Blanc supposedly bargained with the devil to obtain the secrets of roulette, the legend is based on the fact that the sum of all the numbers on the roulette wheel is 666, which is the Number of the Beast. In the United States, the French double zero wheel made its way up the Mississippi from New Orleans and this eventually evolved into the American style roulette game as different from the traditional French game. Jean-Louis Charles Garnier was a French architect, perhaps best known as the architect of the Palais Garnier and the Opéra de Monte-Carlo. 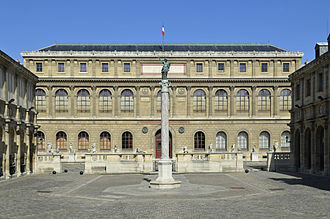 Charles Garnier was born Jean-Louis Charles Garnier on 6 November 1825 in Paris, on the Rue Mouffetard and his father was originally from Sarthe, and had worked as a blacksmith and coachbuilder before settling down in Paris to work in a horse-drawn carriage rental business. 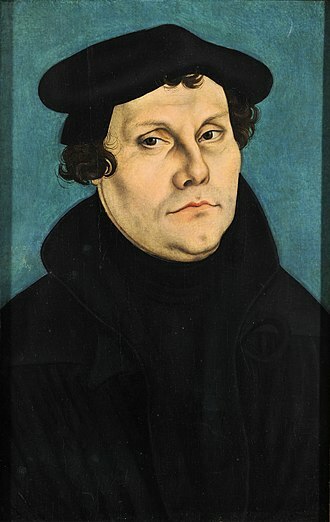 He married Felicia Colle, daughter of a captain in the French Army, in life, Garnier would all but ignore the fact that he was born of humble origins, preferring to claim Sarthe as his birthplace. Garnier became an apprentice of Louis-Hippolyte Lebas, and after that a student of the École royale des Beaux-Arts de Paris. 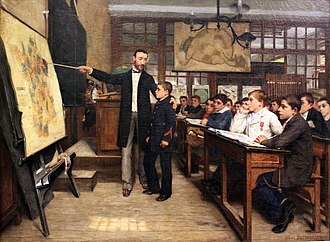 He obtained the Premier Grand Prix de Rome in 1848, at age twenty-three, the subject of his final examination was entitled, Un conservatoire des arts et métiers, avec galerie dexpositions pour les produits de lindustrie. He became a pensioner of the Académie de France à Rome from 17 January to 31 December 1849 and he traveled through Greece which provided him the subject of his fourth year submission, presented at the Paris Salon in 1853. He visited Greece with Edmond About and Constantinople with Théophile Gautier and he worked on the Temple of Aphaea in Aegina where he insisted on polychromy. He was named, in 1874, member of the Institut de France, on 30 December 1860 the Second Empire of Emperor Napoleon III announced a competition for the design of a new, state-funded opera house. The old opera house, located on the rue Le Peletier, applicants were given a month to submit entries. There were two phases to the competition, and Garnier was one of about 170 entrants in the first phase and he was awarded the fifth-place prize and was one of seven finalists selected for the second phase. You have greatly improved your project since the first competition, whereas Ginain has ruined his, soon the thirty-five-year-old and relatively unknown Garnier began work on the building, which eventually would be named for him, the Palais Garnier. Many people had difficulty in deciding exactly what style he was trying to portray, when asked by Empress Eugénie in what style the building was to be done, he is said to have replied, Why Maam, in Napoleon Trois, and you complain. Jagger family grave at Bethel Chapel, Shelf. Blanc's second wife, Marie Charlotte Hensel.